Cantabile were very excited today. They were visited by a BBC camera crew who came to interview them as semi-finalists in the 2014 Songs of Praise School Choir of the Years competition. They were filmed in Hereford Cathedral. This entry was posted in Cantabile Girls Choir, Songs of Praise Choir of the Year on January 25, 2014 by cantabilegirlschoir. 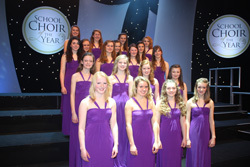 Sunday 16th March is the date for the semi-final and final of the Senior School Choir of the Year 2014. Request your free tickets to come and support us at The International Convention Centre in Birmingham between 2:00 and 6:00 pm. The judging line up includes the classically trained musician, singer and television presenter Myleene Klass and the internationally renowned choral expert and conductor Suzi Digby. This entry was posted in Cantabile Girls Choir, Competition, Songs of Praise Choir of the Year and tagged Cantabile Girls Choir Event, Hereford Cathedral Schools Cantabile Girls Choir Songs of Praise on January 16, 2014 by cantabilegirlschoir. Hot off the press – HCS’s Cantabile Girls Choir is one of six senior school choirs through to the final stages of the BBC Songs of Praise School Choir of the Year. The semi-final and final will be held in March in Birmingham (to be confirmed). After the semi-final the judges will choose three of the junior and 3 of the senior school choirs to compete in the final. More details will be posted when available. This entry was posted in Cantabile Girls Choir, Competition, Songs of Praise Choir of the Year on January 10, 2014 by cantabilegirlschoir.